This giveaway has been generously sponsored by Leisure Arts, Inc. In order to be rewarded the prize, the recipient must have, or be willing to set-up a free online account with Leisure Arts; if this requirement is not fulfilled, a new winner will be randomly selected. Excepted from 99 Snowflakes, Volume 2. Leisure Arts, Inc. I would like the snowflake book, thank for the chance to win a very interesting/informative looking book. Have several Leisure Arts books, the one with the Tunisian vest printed on the cover, Tunisian Stitch guide and just last week bought Fun Way to Learn to Crochet for my granddaughter to learn how to crochet. Got to pass it along!!! Would love the snowflakes book! Would love the Tunisian shawl book. I have purchased a knit lace washcloth book from Leisure Arts–TWICE–because I wore the first one out, but the next purchase would have to be the snowflake book. As for another e-book, I would be interested in purchasing The Ultimate Beginners Guide to Tunisian Crochet. I’ve always wanted to try this technique out! Crocheted snowflakes always remind me of Christmas as a kid! Love it!!! These snowflakes are beautiful! I would love to learn how to block these. 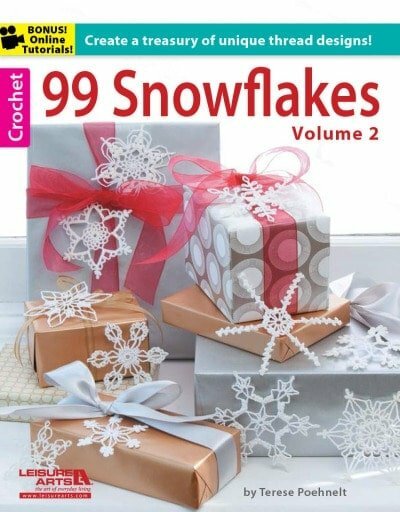 I would purchase this Snowflake book if I were to purchase a book from them. I have been seriously dying to make som snowflakes but haven’t been able to find any good patterns online. How do I sign up for the give aways? Any book with snowflakes! I can’t find mine! thank you for the opportunity to win this pattern booklet. As you might know I make lots of snowflakes! I liked the Blankets for Toddlers e-book. Beautiful snowflakes!! Not sure I am up to the task yet, but you did a beautiful job!! Thank you for sharing!! I love the Angels Afghan Pattern. I would purchase the Hooded Scarves ebook …. or maybe the snowflake one because those are lovely. These are such beautiful snowflakes!